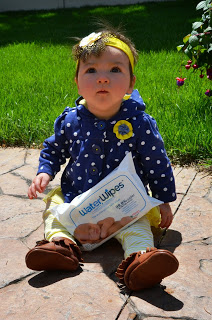 We love WaterWipes products and have been using them since our daughter was born back in September. They work well, clean her up as they are supposed to and most important of all, are gentle on her skin. We have purchased these at our local stores and they are similar in price to other brands. I bought these ones from Babies "R" Us in Roseville, MI. I love that they are not made with harmful chemicals but are made with 99.9% water and 0.1% fruit extract from grapefruit seeds. 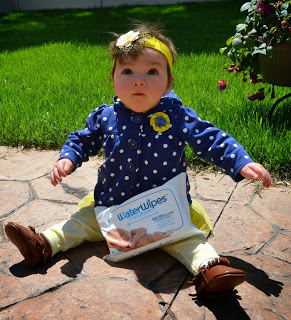 They are a more natural option for your baby and are chemical free. I do not want to put anything harmful on my baby's skin of course and these are perfect for her. Adalyn has only had a minor diaper rash a couple of times and nothing major and I think a big part of that is only using products that are gentle on her soft skin. We also use these to wipe her hands and face after a meal and have had no issues with this. They clean her up in a jiffy! I take them when we travel as well since they come in soft packs that are fairly small so they are perfect for a weekend trip. They come in boxes of 540 wipes and 240. They are also sold in smaller packs as well if you like that option. 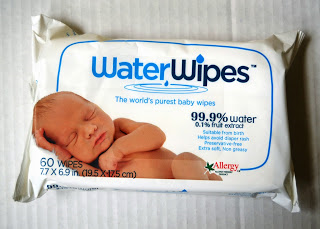 Currently, Babies "R" Us has these smaller packs of WaterWipes 2 for $6 at select locations. They will keep for up to 15 months before they are opened. Once the package is opened, use before 1 month- not hard to do! Haha, babies need to be changed a lot. 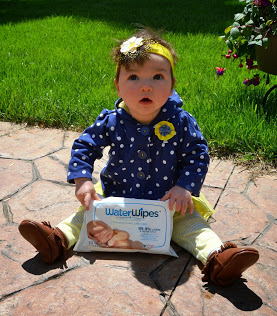 We like WaterWipes and will continue to use them as long as my daughter is in diapers. The giveaway will be for a $100 Babies "R" Us gift card starting July 17-August 19th.